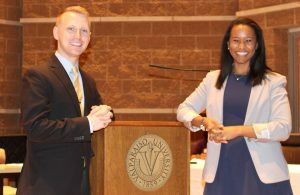 Founded in 1991, the Moot Court Honor Society is responsible for organizing and administering all moot court activities at Valparaiso. Membership is by invitation of the Executive Board after participation in the Candidacy Advocacy Competition. The competition is open to all students who have completed the first year of legal writing. Participation in this program provides students with the opportunity for advanced study in persuasive writing and oral arguments at the appellate level.